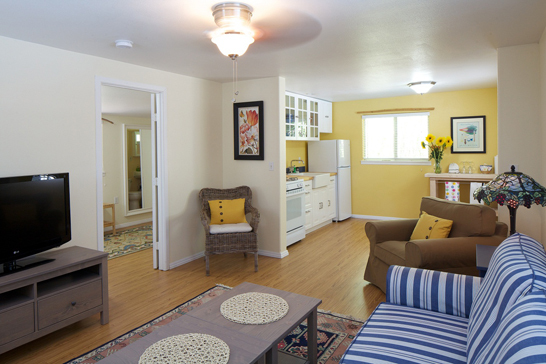 Our One Bedroom Cottage with Full Kitchen offers a comfortable living room and eat in kitchen. The kitchen is fully equipped with a gas stove and oven, refrigerator and microwave. Off of the living room is a balcony and sitting area. In the bedroom, you will find a queen bed and the living room sofa pulls out into a full sized bed. Please contact the hotel directly to book dog-friendly accommodations.